I’ve been in a celebratory mood lately. If you haven’t heard, I got into the course of my dreams : Masters of Education and I can’t be any happier! (: It starts in July so I am really looking forward to that! hehe Plus my significant other has found a job he really really loves, so everything is just falling into place now and I couldn’t be happier! with happiness, comes my wanting to bake of course! Love to share my love and happiness with the things I cook and bake. 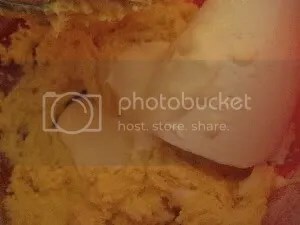 I think that’s how the name of my blog came about. 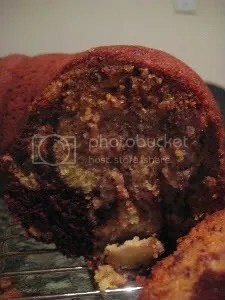 (: A couple of weeks back, I read Laureen’s post on roasted banana bundt cake. 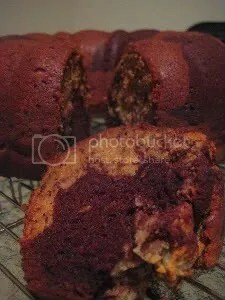 and I have been craving for banana cake for the longest time! The fact that she roasted her bananas before mashing them, I was intrigued by it and really want to give it a go! so what goes really well with banana? Chocolate! haha actually, I think chocolate goes well with almost everything and anything! 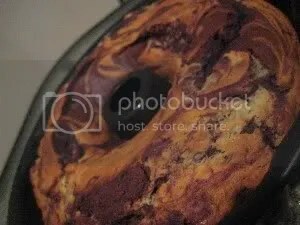 SO I decided to make a marble cake, with a twist! Preheat the oven to 200C. 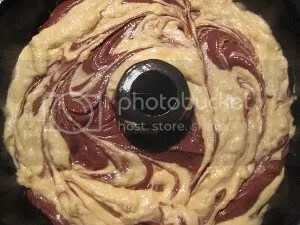 Generously grease a bundt pan with butter and set aside. 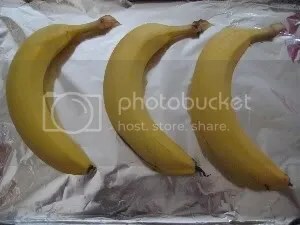 Place the unpeeled bananas on a baking tray and roast them for about 10 minutes, until their skins are blackened. 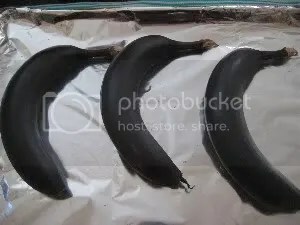 Remove the bananas from heat and turn the heat down to 170C. Peel and mash the bananas and set them aside. 3. 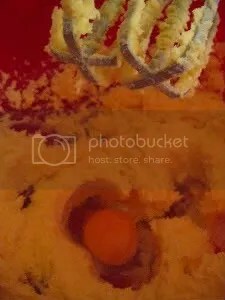 In a bowl, whisk the plain flour, baking soda and salt together and set aside. 4. In another bowl, sift the cocoa powder and set aside. 5. 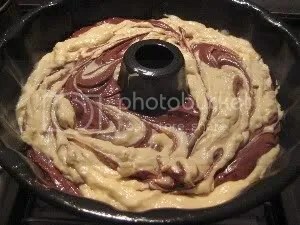 Cream the butter in the bowl of an electric mixer until creamy. Add the sugar gradually, mixing well till pale and fluffy. Add the vanilla and the eggs, beating well after the addition of each egg. 6. Add half the flour mixture and mix until the mixture comes together. Stir in the sour cream and cream before folding in the rest of the flour mixture. 7. Take half the mixture and put in another bowl. 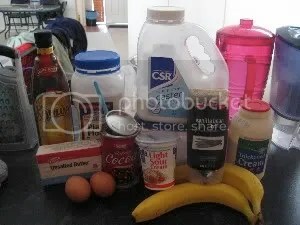 In the first half, mix in the cooled mashed bananas and 1 tbs of milk. Mix till smooth. In the other half, add the cocoa powder, a splash of the Kahlua and 1 tbs of milk. Also mix till smooth. 8. 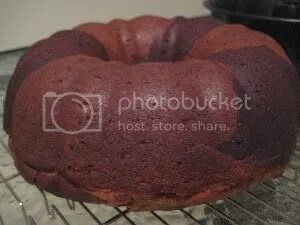 Put the 2 mixtures into the bundt tin alternately then use a knife to run through the mixtures to give the marbled effect. Bake it for 45mins or until the top is brown and your toothpick comes out clean. 9. Remove from oven and let it cool for 10-15 mins before turning out of the tin. VIOLA! (: hehe it came out nice and perfect! Aww. this looks divine. I bet they made the house smell absolutely amazing too. 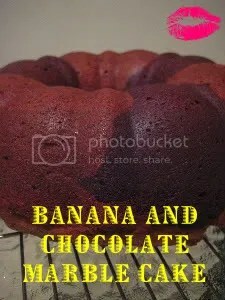 Chocolate and banana always make a good marriage. Lianna, banana breads and cakes are some of my favorites! My dad always asks me to bake him some when I visit him. I love the way you combined the chocolate to add an extra twist. This looks great!